Well, it’s sure hard to write anything about Doom Patrol 2. But really, that’s because Way and Derington have done such excellent work on it. I don’t want to spoil any surprises, and I’m also far from certain what is going on. Larry Trainor, Negative Man, is brought back in this issue, I can reveal that with no qualms. The negative energy being that inhabits him shows up as well. Many stories over the years have developed the notion that the energy being is a sentient entity unto itself, and Way is clearly expanding on that notion. Poor Casey Brinke has to deal with her very odd new roommate, a mysterious dispatcher with its own agenda, a rebuilt Robotman, and what in the world is going on with that tooth? It can be very difficult to throw in a lot of strange and, for the moment, unexplained events into a story and not alienate a reader completely. I believe that this book is succeeding by balancing these bizarre moments with the thrill of seeing old familiar characters and locations. Essentially, Way is building a trust with the reader by demonstrating his intent to satisfy. The last couple of pages of this issue made me so very happy that I am perfectly willing to believe that all the strange things along the way will be satisfactorily resolved and explained over time. It’s quite the tightrope to walk. 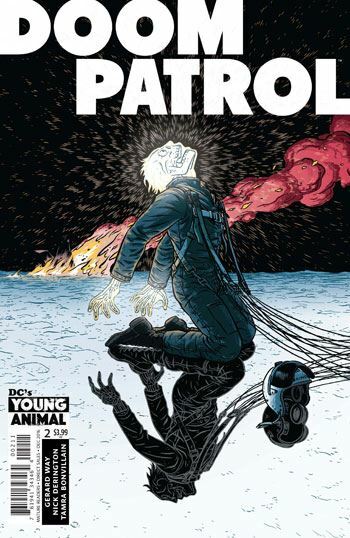 Bringing back enough to make it feel like the real, the right, Doom Patrol, but at the same time injecting enough that is new to make it one’s own. Derington’s art does a lot to help make this work. His renderings of familiar characters are spot on, Robotman looks great, and he was so precise in the location Casey winds up in towards the end that I knew exactly where she was before the big reveal. At the same time, we get such wonderfully strange shots, like the cat licking up the fluid Robotman’s brain is sitting in. And it all feels very casual and real, even when we are completely outside reality.